Tomorrow my niece and her two children will be visiting us. So I thought to go and buy some candy for the kids, but I didn’t want to get the standard super sweet sugar rich stuff. So I made a little trip to Enschede to see if I could find something nice for them. And I found something from my own youth… “zoethout”. It has been ages ago that I have seen this for the last time, which doesn’t mean it was not available. I just didn’t see it. Maybe I should explain what “zoethout” actually is. 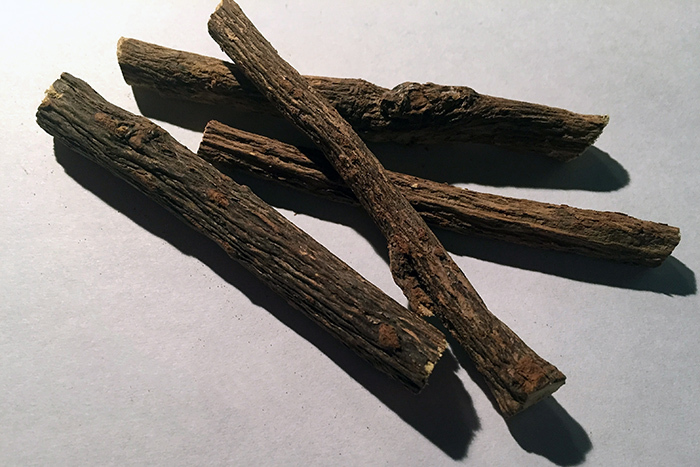 “Zoethout” are small pieces of the root from the Lycyrrhiza Glabra plant. The plant contains a sweetener that some 30 to 50 times as strong as sugar, but is not harmful for the teeth. You really have to chew really on it to get the sweet fluid extracted from the root, which seems to be good for your teeth. When I was a young girl I was crazy about “zoethout”. We had it often at home, so I could often be found chewing on a piece of it. I can remember that my father also used it a lot when he stopped smoking (and he was successful at that). Talking about smoking, liquorice was in the past used for flavouring cigarettes, moist snuff, chewing tobacco, and pipe tobacco. It is also used in many kinds of candy. And over here in The Netherlands in our famous (loved and hated) “drop”. Oh nice, when I was young there also always “zoethout” around and just as you I loved it. Can you keep a piece for me? I would like to try if I still like it or not. I must say that I kinda like it. It reminds me of my beloved wiebertjes!